CO2Cab - G & W Machinery Sales, Inc. The CO2Cab Cutting System Series is a fully integrated fully enclosed 10.6nm CO2 galvo system unlike any other system on the market. 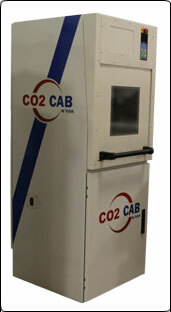 The CO2Cab is both a marking and cutting solution for many organic and inorganic materials. The CO2Cab Cutting System utilizes all Metal sealed CO2 laser sources made in the USA and designed for trouble free operation for many thousands of hours. Our CO2Cab Cutting System is a fully enclosed Class I devices that can accommodate lasers from 35 to 400 watts. The CC Compact is the perfect entry level system for low production requiring laser marking or engraving. The CC Compact is lightweight, affordable and set up is as easy as plugging the system into a 110 VAC outlet. The CC Tower is a free-standing system that can be equipped with a Rotary indexer for circumferential marking or a rotary dial table for higher throughput of direct part marking. The CC Tower Plus is our largest standard CO2 laser marking and cutting system. This system has an oversized enclosure and a host of available options and can be set up for just about any task. Vytek's CO2Cab system is fully enclosed Class I galvo device that can accommodate a range of CO2 laser sources based on the customers needs for speed and accuracy. The base CO2Cab system is a steel structure designed specifically to reduce the effects of the surrounding vibrations while offering a thermally stable support structure. 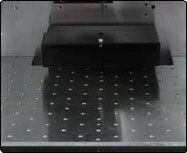 The Galvo assembly is mounted on a high precision Z stage which itself is mounted to a precision surface. The support structure for the table is a ground thick Aluminum support ready to accept a customer supplied fixture assembly. The system can also accommodate our optional integrated fume extractor/filter making it a stand alone system requiring only power to be fully functional. With a wide range of working field sizes available the CO2Cab can be set up for just about any application the user has. • Programmable Z-axis vertical capability to accommodate a variety of material sizes and lenses. • Heavy duty laser safety enclosure with viewing window for visualization of lasing process and visual alignment. • Standard 160 F-Theta lens others available to increase marking field.